(L-R) Chris Nikou and Danny Moulis. After one of the most tumultuous periods in Australian football history Chris Nikou and Danny Moulis are hoping to lead the sport into an era of prosperity and unity. 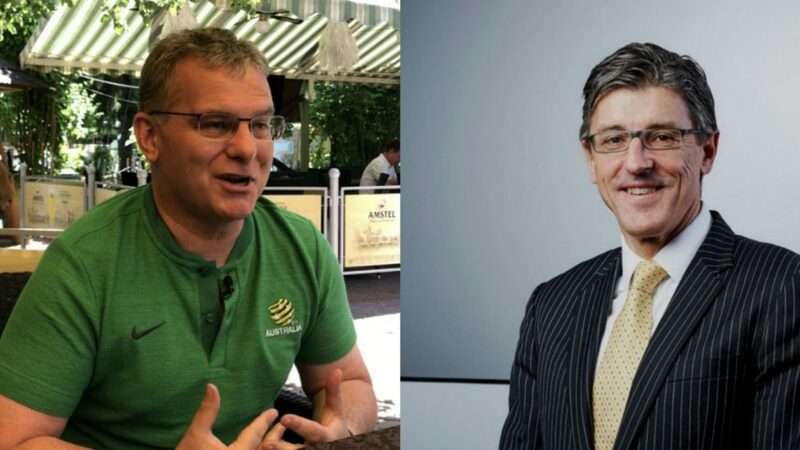 They are both hoping to be re-elected to the FFA Board when representatives of the FFA Congress decide the future of the game’s governance on Monday 19 November. With no representation for the players or women at the time, the congress was the smallest representation of football stakeholders within a FIFA nation. The governance stalemate led to the much needed expansion being delayed. The infighting had fans put off and as a result A-League crowd numbers and TV viewership figures dwindled to record lows. Meanwhile, the NPL clubs sick of being ignored, created an alliance and formed the Australian Association of Football clubs (AAFC). As well as seeking to be part of the FFA Congress, they were aiming to create a national second division by 2020, eventually leading to promotion and relegation. Finally the stalemate was broken in October’s Extraordinary General Meeting (EGM) when the FFA Congress was expanded giving a greater say to A-League clubs and to the players representatives and women. The AAFC, fan groups, coaches and Fustal were also given a chance to get representation in the future. The EGM also voted unanimously to set up a new A-League body to run the competition independently of the FFA in return for paying the FFA an annual fee. Despite being on the FFA Board for the past four years, many see Chris Nikou as independent from the previous Lowy regime and an ideal replacement for outgoing FFA Chair Steven Lowy. Nikou has a deep knowledge of the sport. After playing football at the local state league level he was a Director and Appeals Board Member for Football Federation of Victoria (FFV) and became a Company Secretary and Melbourne Victory Board member. As a result of his time with Victory and FFV he was asked to join the FFA Board in 2014. As FFA Director Nikou was responsible for the review that made recommendations that the strict policy towards fans be changed. When in 2016 thousands of A-League supporters boycotted matches due to the treatment by police, security and the media. Nikou’s impressive CV also saw him become part of the organising committee for the 2015 Asian Cup after being appointed by the Victorian government. In addition to his football nous, he has expertise in the corporate world after having been a lawyer for over 25 years, including in his current role as a Senior Partner of global legal firm K&L Gates. Nikou is also a proponent of expansion, a second division as well as promotion and relegation. Importantly, his time working with the Congress Review Working Group means he has healthy relationships with the A-League clubs, the Member Federations and the PFA. FFA Director Danny Moulis told Neos Kosmos that if Nikou is appointed as new FFA Chair his balanced and conciliatory style would be good for Australian football. “Chris is a very thoughtful fellow and he evaluates things and listens to everybody’s views and reflects back those views very well,” he says. Moulis himself is one of the few FFA Board nominees with football experience at the highest level after playing for the Socceroos on four occasions. He has the distinction of playing in the first ever NSL match for Canberra City in April 1977 against West Adelaide when he was just 16. Unfortunately an injury ended his career prematurely and he was forced to retire at 21. His career post football saw Moulis become a prominent lawyer in Australia with his practice having offices in Canberra, Brisbane and Melbourne. He is highly regarded around the world for his knowledge in international trade law and has 17 years’ experience working as a Dispute Settlement Panellist with the World Trade Organisation. He stayed involved in football and was Chairman of the Canberra Cosmos, a director of the Johnny Warren Football Foundation and after serving on the Disciplinary Committee of FFA for seven years he became a FFA Director in 2015. Moulis told Neos Kosmos that he has relished his three years working at Australian football’s governing body and is excited about the game’s future. “I first came on to the board wanting to expand the A-League,” he says. “That is an important goal and we need to bring high level competition into more communities across Australia definitely. Moulis believes that football will only reach its huge potential if the football community is united. “I don’t like this old soccer vs new football stigma,” he says. “We need to be inclusive of everyone. I don’t agree with the national club identity policy and the way that attempts to dictate clubs who have got a huge history and how they should name themselves. Moulis also believes that those making decisions at FFA level need to be more transparent. “The corporate spin needs to stop,” he says. “The passion of the football community needs to come through. It’s not about how much money FFA should make. It’s about how much money football should make and however we achieve that working with our A-League clubs and all our different stakeholders groups. With football having the highest level of participation Moulis believes that the game must take advantage of those who adore playing and watching football. “As a Board we need to have philosophies and policies for the advancement of the game,” he says.